Welcome to the voice for an energy efficient economy. Efficiency Canada is the national voice for an energy efficient economy. Efficiency is a low-cost and abundant energy resource that must become top of mind amongst policymakers and consumers for Canada to move to a low carbon economy. Housed at Carleton University, part advocacy organization, part think-tank, part data-driven start-up, Efficiency Canada advocates to make our country a global leader in energy efficiency. We convene people from across Canada’s economy to work together to advance policies required to take full advantage of energy efficiency. And we communicate the best research out there to build a more productive economy, sustainable environment, and better life for Canadians. 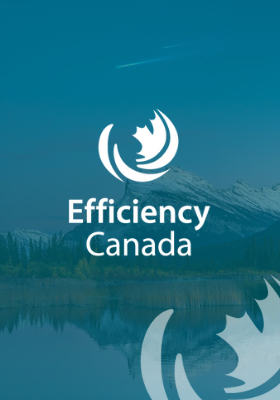 Through targeted campaigns and advocacy activities, Efficiency Canada will help policymakers and influencers move the needle on energy efficiency across Canada, every step of the way. Now is the time to build on the momentum driven by utilities, governments, agencies, consultants and NGOs, who have been working tirelessly to engage Canadians on the critical issue of how we use energy. Our goal is to make energy efficiency – through an economic lens – top of mind for policymakers. To do that, we aim to make the complex, simple; the story, compelling; the stakeholders, heroes; the mundane, exciting. Efficiency Canada is mission driven and fiercely independent, embracing an entrepreneurial attitude to our work. Our employees have each other’s back and promote each other’s success. We practice integrity, honesty, open communication, and discipline. At Efficiency Canada, we believe in giving back as well as having fun at work. Above all, we respect each other’s differences and embrace what we can accomplish together.